As reported in the Wessel book, 4-H: An American Idea, in the fall of 1946 Ed Aiton (a member of the National 4-H Staff at USDA) had been assigned to look into the possibility of international farm youth exchange programs. At nearly the same time, O. T. Norris of the Young Farmer’s Clubs of Great Britain was visiting in Washington. Prior to the war, the United States and Great Britain had exchanged dairy judging teams and Norris was interested in seeing the exchange renewed. Very quickly the two ideas coalesced into a general exchange of farm youth. Here are the British visitors. From left, 21-year-old Hywel Evans; Stanley A. B. Gray, 20; William Edge, 21; group leader John L. Cornah, 23; Kenneth J. Osborne, 21 and Alexander Campbell, 20. Until more plans could be made, the two agreed that a visit of several young English farmers to the National 4-H Congress in Chicago would be a good interim idea. The young men traveled to Chicago and were very much impressed with the Congress and discussed the idea of a general international exchange. At the Stevens Hotel (later Conrad Hilton), Aiton invited the gathered state 4-H winners to donate funds in order to send seven American farmers to Great Britain the next year. The delegates were enthusiastic with the suggestion and started taking up a collection right there during the assembly; from the balcony surrounding the auditorium 4-H’ers from across the country were dropping dollar bills, showering down on the delegates below, supporting the effort. The generosity of the 4-H delegates provided the initial contribution for sending the Americans to Great Britain in 1948, starting the International Farm Youth Exchange (IFYE) which officially began in July of that year. 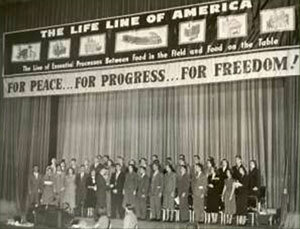 1950 returning IFYE delegates meet with the Grocery Manufacturers of America. This entry was posted in History and tagged Alexander Campbell, Hywel Evans, IFYE, John L. Cornah, Kenneth J. Osborne, Stanley A. B. Gray, William Edge by Larry Krug. Bookmark the permalink.